Everything about Will Allen is big. The pro basketball player turned urban agriculture iconoclast has hands like baseball mitts, and arms like tree trunks. His normal uniform—jeans, baseball hat, hooded sweatshirt with the sleeves removed—only serves to emphasize the power of his gentle, hulking presence. In 1993, after leaving a job in the corporate world, Allen purchased the scant two acres in northwest Milwaukee that would become Growing Power, his urban farm. He immediately started growing, inviting people from the neighborhood to get involved and share in the bounty. Thanks to creative use of space, innovative sustainable farming practices, and Allen’s zealous commitment to compost, the farm has become stunningly productive—a paragon of high-yield urban agriculture and community activism. In 2008, Allen was awarded a MacArthur Foundation Genius Grant. In April, appearing as keynote speaker for the Pennsylvania Horticultural Society’s Compost Matters Conference, Allen decided to dress it up—a hoodie with the sleeves intact. Grid grabbed a few minutes with him after his talk, wrangling him into a quiet corner of the auditorium. Fortunately, he came willingly. Dude is huge. You’re very into growing greens. Lots of greens. We grow 159 different varieties of vegetables, a little bit of everything. But in the winter time, because of the heat factor and the light factor, greens are the easiest to grow. But as we add more renewable energy to our system—and are able to use more artificial light—we’re gonna get into warm weather crops like tomatoes, peppers, and cucumbers. There’s big opportunity there. Not everybody wants to eat seasonally. You know it’s hard to convince people to rely on potatoes, carrots and root crops. We’ve kind of spoiled ourselves. People don’t can anymore. People want fresh stuff, so it’s important for us to grow a broad spectrum of crops year round. You talk about compost on a large scale, but what would you tell an urban apartment dweller? What can they do? You can actually compost anaerobically [without air] in a simple five gallon bucket. All you need is some carbon—newspaper, magazines—to mix in with your food waste. If you’re single, it would probably take a month or more—unless you were a ferocious eater [Allen laughs]—to fill up that bucket. The best food waste is 20 percent solid, so it’s gonna shrink. The carbon absorbs all the moisture and it starts to break down in the bucket. Say over winter, you collect three buckets, you’ll have quite a lot of stuff. Then you can either take it somewhere or combine it with neighbors and set up a little program. If you have enough friends and everyone donates, it’s amazing how much you can collect just by setting up a little compost co-op with friends. When the springtime comes, find a little spot in someone’s backyard. Your compost will already be well on its way. In two months you can start growing. A lot of people would worry about the smell. You just need a bucket with an O-ring gasket. They’re easy—not like the old days. You can go buy one at any paint store, or somewhere like Loews. They keep the smells inside. Absolutely no smells! Unless you leave drippings hanging down in the bucket or something. [Allen laughs] You can decorate them, get a white one and paint it or put little decals on it. The press has obviously been a really powerful tool for your message; I first read about you in a New York Times Magazine feature. I think there’s a big shift in public perception going on—from “sustainability” being sort of a hippy-dippy yuppie thing to being a broader movement. As a person of color, running a really diverse organization, you’re harder to pigeonhole. Even though I don’t talk about it a lot, I think that has been one of the big changes. Because I am a person of color, I think it has probably made a lot of people more comfortable talking about these issues. When I first started doing this, I’d go to meetings and I’d be the only person of color for many, many years and that’s changing now. We need to dismantle a lot of the racism around the food system, in terms of redlining in communities, with grocery stores not wanting to go in and funders denying funding. 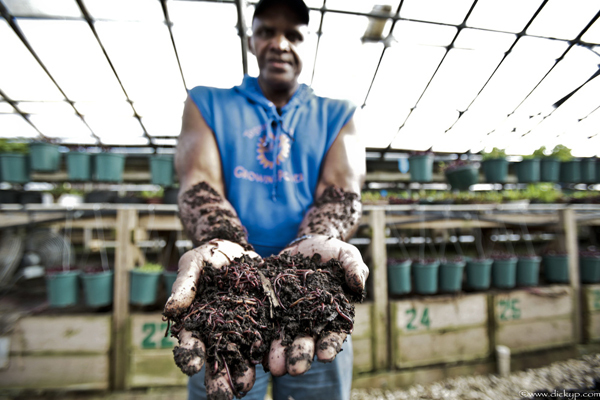 Most of the people in organizations that are doing [urban agricultural] work are doing it in people-of-color neighborhoods. We need to do things in a very multicultural way. We can’t just do it by slamming people into the ground, we need to do it, you know, the way we’re doing it—through action, through projects, and bringing everybody to the table and discussing the problem up front, not trying to slide it under the table and pretend it doesn’t exist. I think being a person of color in a forgotten urban area has also brought you a lot of attention. I mean, it’s a great story: You’re in Milwaukee! Milwaukee, I think, is now the urban ag[riculture] capitol of the world, or close. The largest urban ag small farm conference ever held will be in Milwaukee this September. We don’t go out there and tell people, “Here we are as an organization! We’re going to come into your community and change the world.” We get invited into communities. We don’t ever go out there and solicit work. We built this center in Milwaukee that people came to see, then they went around the country and told other people. So, if you come and you like what you see there, then go out and tell ten of your friends, that’s how you build a revolution. If there’s one policy change that a local government can make, what would it be? There’s several. They need to change policies on composting, on beekeeping, and allow citizens up to four chickens in their backyard—not roosters, but layers. Beekeeping is something that is very wonderful to do. And every city government needs at least one person that works with community gardens and community farms—a liaison between politicos and the people that are doing the work. In Milwaukee, I can almost do anything. The government may not have money to give you, but they won’t stand in your way when you have a good idea. They look at Growing Power as an asset to the city. We’ve brought in millions of dollars to the city of Milwaukee and they know that. We can create thousands of jobs with this new kind of farming, with urban agriculture. Just think of all the categories of jobs: you’ve got installers, carpenters, plumbers, truck drivers, accountants, electricians, aquaculturists, planners, architects. In a rural area, you don’t need these jobs. Industrial agriculture gets rid of jobs; the machines do everything. This is hand work, it’s communal work, which is important and fun for all of us, all the generations, from little kids to school-age kids to teenagers to college kids. Everybody is involved. Now politicos are involved, corporate companies send their associates to volunteer and corporate companies have foundations to supply some of the money. We also need reporters and publicity people, because one of things that we haven’t been able to do is be proactive and get the word out. All of these wonderful projects are hidden away. We need the public.